Makauri Annual School Picnic ... Mr Robb, photographer, kindly came forward and took a picture of the group. Mr James Robb, photographer, starts on a second trip to the Nuhaka springs tomorrow, with the intention of adding a further series of views to those previously taken. We have had the pleasure of inspecting some proofs of views that Mr J. Robb took on his last trip to the Nuhaka hot springs. 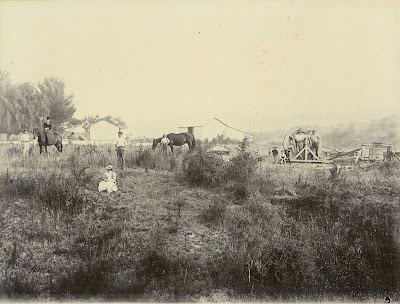 The views commence at the bottom of the fern avenue, and Mr Robb has worked his way right up to the upper springs, and has succeeded in obtaining capital views of some of the choicest bits of scenery it is possible to conceive. He informs us that the baths are thronged with Natives, and one or two Europeans have been camped in the vicinity, and have derived great benefit from using the baths and taking the waters. Some of the beautiful tree ferns have been destroyed by the Maoris, and the Government should at once take prompt action in preventing this lovely spot from being deprived of some of its most attractive features. 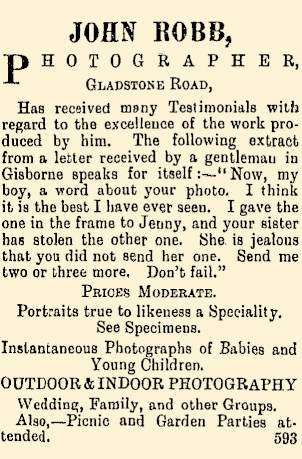 In the Magistrate's Court this morning, before Mr J. Booth, S.M., D. Mclnnes, photographer, of Hastings, sued Heni Mataroa (Mrs James Carroll) for £10, the price of two enlargements of photographs in oils. One enlargement was accepted, but in regard to the other, a likeness of Mrs Carroll's mother, the price of which was £5, the defendant contended that it was not a good likeness, and objected to pay for it. Mr R. N. Jones appeared for the plaintiff, and Capt. Tucker, as agent, for the defendant. 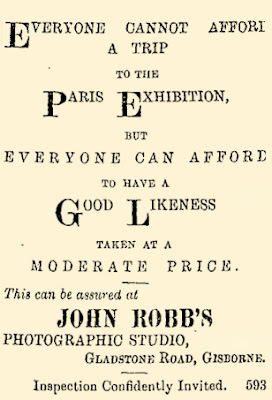 J. Robb, photographer, Gisborne. 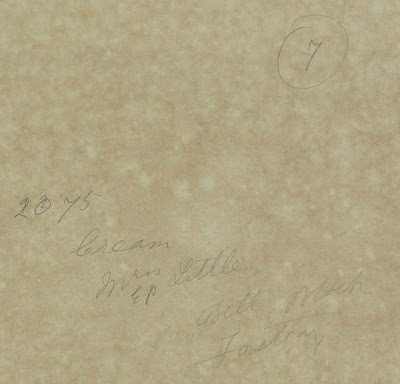 said he considered the enlargement was a splendid copy of the original photograph. He denied that Mrs Carroll had asked him to take it away after he had delivered it, although she said it was not a likeness of her mother. Mrs Carroll stated that she was not at home when Mr Robb left the picture at her place, but after she had seen it she told him it was not a bit like her mother, and that she wanted him to take it back. He refused, saying he had no power to do so. If it had been a good likeness she would have been willing to have kept it, and paid for it. 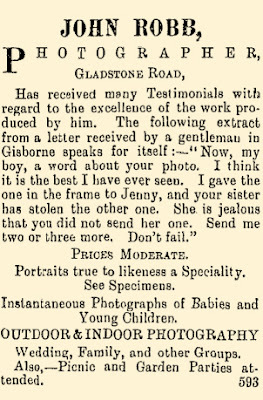 To Mr Jones: She had not agreed to pay for the picture since it was left at her place. As the photograph from which the enlargement was made had not been produced, his Worship reserved his decision until he had seen it. Mr J. Robb, photographer, arrived from Wairoa yesterday, having driven through by way of the Nuhaka Springs. He is the first one to drive through by this route, the road not yet being open for traffic. The last three miles is at present under construction, and will be open in about a month. Mr Robb had to take the horse out and drag the trap over the incomplete portion of the road. Keeping pace with the times Mr John Robb, photographic artist, has just completed considerable alterations to his studio in Gladstone Road, the increased facilities afforded thereby enabling him to more successfully provide for the requirements of the public. The premises have been enlarged and thoroughly renovated throughout. 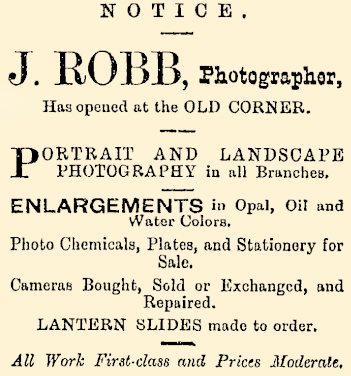 Added to this Mr Robb has recently imported new and up-to-date appliances, which make it possible for him to produce photographs the workmanship and finish of which are not,to be surpassed in any of the larger centres. The camera in general use is one of the latest improved British type, and produces pictures from 15 x l2 down to cartes de visite. 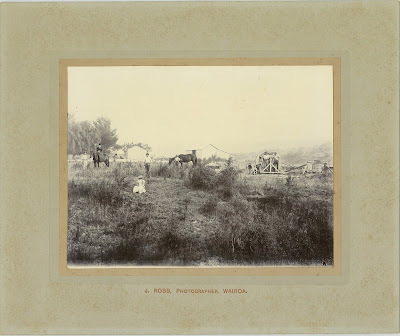 The show room which opens on to the street has been tastefully arranged, and there is a fine display of photographs of persons as well as some charming views of New Zealand scenery. The latter include scenes of Waikaremoana, Nuhaka, Frasertown, Wairoa, Napier, Gisborne, and suburbs, the workmanship of which will stand the closest of criticism. The studio itself is a picture, no pains having been spared in the furnishing and decoration thereof. A variety of screens for backgrounds are available, and all other necessary appliances are in keeping with the requirements of the business. Excellent arrangements here have been made regarding the matter of lighting, so that photographs can be taken at all usual hours. The establishment, whilst not on an extensive scale, is replete with every necessary convenience. 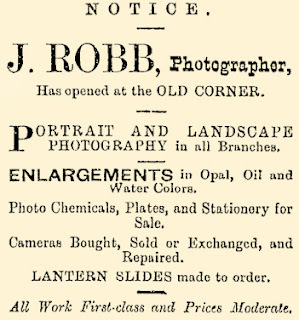 Mr Robb having obtained all necessary facilities is in a position to undertake the enlarging and artistic coloring of photographs. He does not confine himself to work on the premises, but is ready on due notice to take views at private residences, wedding and picnic groups and such like. Mr Robb has had lengthened experience as a photographer in other parts of the colony, and in commencing business in Gisborne he will no doubt receive a fair share of public patronage. Mr John Robb, photographer, writes : Sir, — In reading last night's paper I was surprised to read an account of Messrs. Des Barres and Harding being the first to drive a vehicle through to Nuhaka. With all due respect to those gentlemen, I may say I drove my horse and gig through from Wairoa to Gisborne some eight months ago, and Mr Johnson (late of Nuhaka Hotel) told me since that several Natives had driven through shortly after.